All 26 current varieties of canned 30-year MH food are in stock, fresh and ready for prompt, FREE shipping. It's all on sale. All right from the factory! All MH pouches are also on sale right now! Up to 31% off! PLUS of course, buyers club member purchases result in 2016 Member Reward Points! 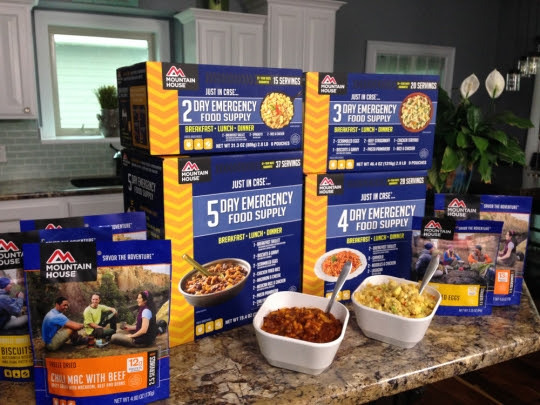 Mountain House Cans up to 39% off for members + Gift Certificate + Reward Points! 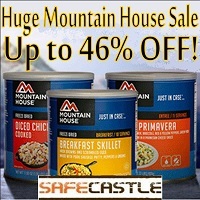 MOUNTAIN HOUSE CANS up to 39% off for Members! PLUS gift certificate member incentives! PLUS 2016 Member Reward Points! We've got all current varieties (by the case) of canned 30-year MH food back in stock--ready for prompt, FREE shipping. And it's all on sale for our buyers club members. All factory-fresh! Or maybe you prefer Mountain House in the 12-year pouches? We've got them by the case, bucket, and kit, and they are all on sale as well, up to 31% off. 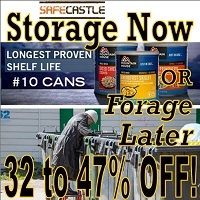 Needless to say--everything ALWAYS SHIPS FREE at Safecastle.